Cream cheese and Neufchatel are fresh, or unripened, cheeses made by curdling milk and draining the whey, while retaining enough moisture to make them soft and spreadable. The two cheeses are similar in taste and appearance -- one could be substituted for the other -- but differ slightly in nutritional value. Made from high-fat milk, cream cheese contains 33 percent milk fat, reports the Food Network. Neufchatel originated in France, where it was made from milk and ripened for 10 days to four weeks. American Neufchatel cheese is unripened and made from milk containing about 23 percent fat. Nutritional values are based on a portion of about 4 ounces, or 42.5 grams, for each cheese. 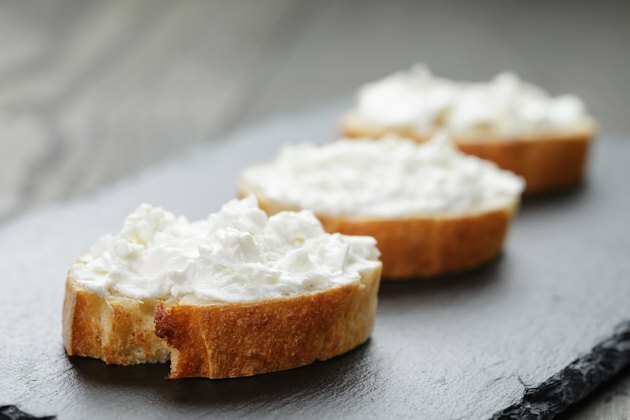 Neufchatel might normally be lower in fat and calories than regular cream cheese, but it can't beat cream cheese that contains one-third less fat. Four ounces of Neufchatel contain 108 calories and 10 grams of total fat, compared with low-fat cream cheese that contains 85 calories and 7 grams of total fat. The cheeses have similar amounts of saturated fat -- 4 grams in low-fat cream cheese and 5.5 grams in Neufchatel -- but Neufchatel has 31 milligrams of cholesterol, while the cream cheese has 23 milligrams. The American Heart Association recommends limiting total fat to between 25 and 35 percent of your total daily calories. Based on a 2,000 calorie-a-day diet, a 4-ounce portion of cream cheese has 3 percent, and a similar portion of Neufchatel has 4.5 percent, of total daily fat. Both cheeses provide 3 to 4 grams of protein. One-third less fat cream cheese provides 17 percent of the daily value of vitamin B-12, compared to Neufchatel that only has 5 percent. Vitamin B-12 lowers your risk of cardiovascular disease, protects nerve cells and helps make red blood cells. Your eyes need vitamin A to stay healthy, and you can count on getting 12 percent of its daily value from Neufchatel or 8 percent from low-fat cream cheese. The two cheeses have about 2 percent of the recommended daily value of thiamin, folate and vitamin B-6, and 5 percent of riboflavin. Thiamin and riboflavin are B-vitamins essential for the creation of energy and maintaining your nervous system, hair and skin. Vitamin B-6, required for serotonin synthesis, reduces your risk of heart disease. Folate also contributes to cardiovascular health. You'll get the same minerals from Neufchatel and cream cheese with one-third less fat, because the amount differs by only 1 percent. Both cheeses provide 5 to 6 percent of the daily value of calcium, 8 to 9 percent of phosphorus and 2 to 3 percent of the daily value of zinc, which supports the immune system and must be present for normal growth and neurological development. Cream cheese is higher in salt, at 200 milligrams of sodium, compared to the 142 milligrams in Neufchatel.